Well, there you have it, folks — 2017. A little less than a year ago we announced that 2017 was going to be a big year for us, and that prediction turned out to be true. 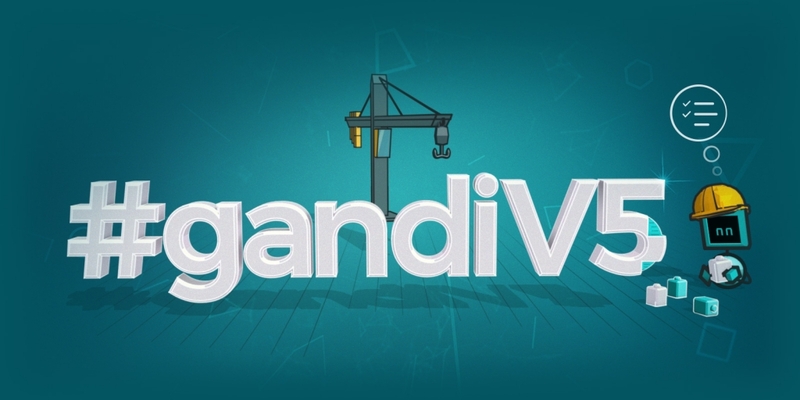 Starting in January, #gandiv5 has been gradually rolling out as the default website in new countries and improving along the way. But we won’t lie — 2017 was also a tough year. Motivated by the fact that we’d patched up and fixed v4 about as much as it could take, we made the decision in 2016 to build a new platform from the ground up: a modern, efficient platform that better met the needs of our present and future customers, directly and indirectly. For better or for worse, the exigencies of the marketplace led us to rethink and reinvent much of our business, without losing the confidence of our customers, all while trying to preserve the quality of services and upgrading the underlying infrastructure deployed across three continents. We knew that would be quite a gauntlet to run, and we’d be dishonest to say we didn’t come away from it totally unbruised: we lost some good employees that have proven hard to replace, disappointed some of our favorite customers with an apparent inability to react quickly enough to respond to their specific needs. And while we know now that the hardest days are behind us, we’re aware that our work is not yet complete if #gandiv5 is to live up to our expectations and yours. Our decision to deploy a minimally viable product that at first met only the most basic needs, with a constantly improving, battle-tested UX and a growing number of functions and services gradually blinking on over the months was not one that was always understood, and it caused a lot of difficulties and frustrations, even within Gandi. But we are nonetheless proud to have seen our global team rise to the challenge and help clear the way for a smooth transition in to a new era. Whether in Paris, Luxembourg, Taipei, or San Francisco, the entire Gandi team leapt into action, each in their own way. And in the process our teams collaborated, adapted, and helped each other more than ever, so that we can continue to offer you to level of service that you expect from us. Our Customer care team in particular has been especially taxed during the last few months and has nonetheless assured an exemplary level of service given the circumstances, and continued to remain an efficient, well-oiled machine despite the challenges. Our technical teams have guided us through data center changes and the creation of a new infrastructure, all while minimizing downtimes and maintaining consistent performance levels and our Dev teams are in the process of deploying a new interface that corrects the numerous challenges on the current #gandiv5 interface that we are now all too familiar with. And on that note, we should thank you for your feedback, which has served to reinforce our resolve when positive, and rethink our approach when not. The year 2017 was tough, then, and you probably noticed as much already. What we’d like you to take away from this, though, is that we’ve drawn a lot of meaningful insights from the experience, which we’ll use to drive us forward in 2018 when we’ll set out to perfect the new interface. In the meantime, we’ve hired — and are hiring — front and back end developers, support agents, and OPS and we’ve fleshed out and reorganized our managerial team in order to assure that all our teams are in tip-top shape and so that we can continue to deserve the trust you’ve given us for the past 17 years. For now, keeping checking this space as well as our other communication channels! We’ll be sending and posting updates on what we’re up to, the challenges we’re facing, and new technical solutions that we’ve deployed, and we’ll be bringing you periodic updates from our teams in the trenches, so to speak, as well. Stay tuned as well for when we announce meet ups that are to come, when we’ll have the chance to meet face-to-face over a pint or a soda or whatever your drink of choice. In closing, thank you for your ongoing trust this year. Happy New Year! Bravo à l’équipe de GANDI pour cette excellente v5. Je l’utilise avec plaisir depuis plusieurs mois. Oui, il y a eu des hic pendant la beta, mais le résultat en vaut la peine. Très beau, notamment la gestion des équipes et l’intégration des domaines à travers les différents comptes. so basically this means the new interface would still not be finished any time soon? It’s a work in progress on which you’ll see improvements day after day, but we might never consider it as ‘finished’: once we will have improved the existing main features, we will add some more! Last week we tried to point them to our new website for our pre-launch testing only to find out they had never been registered even though they appeared in the control panel and billing Admin (2 receipts) as being registered paid for 1 year each. All of our customers corporate marketing material (months of work) for their launch point to these domains. Luckily they had not been registered by anyone else in the meantime. We quickly re-registered them again a second time and were charged $81.07 each ($162.14 total). The initial cost of the domains were $13.00 each ($26.00 total) in May. We submitted a support ticket (that nonetheless took 6 days to respond to – ok holidays) and asked that you reimburse us the $162.14 seeing that we had already paid for them in May. Your customer care rep acknowledged the domains had been paid for in May admitted there was an error on the platform but refused to reimburse us and credited us $26.00 on future purchases instead. We are highly unsatisfied with this response and ask that you either debit the $26.00 credit for the initial purchase and reimburse us the $162.14. you can explain to us and the rest of the world why customers have to pay for your mistakes and kindly accept the $26.00 credit back as a parting gift on our behalf. Maybe it goes without saying that this is far from a typical experience but that doesn’t make it any less distressing or frustrating for you of course. While we may have been busy the past few weeks, we do take these kinds of situations very seriously and to the extent that you have been made to feel like we don’t, on behalf of our team here I offer our sincere apologies. As for the resolution of this matter, from what I can tell, we haven’t finished working on this one yet. It’s been referred to our Legal team and they are reviewing this incident with all due diligence. You are free, of course, to request an update by replying to the most recent email in the meantime, but you can expect that once our legal and customer care teams have had the chance to fully investigate this, you’ll receive a fair resolution. Obviously I just reply to comments on the blog, so I’m in no position to guarantee you anything, but I can assure you that we’re not trying to scam you or cheat you and that we will do what we can to make it right. I hope that’s assurance enough for you for now, pending the response to your ticket from our teams.